CHARITY shop volunteer Peter Edge had the shock of his life when he nipped to the toilet – a six-foot long snake had beaten him to it. The 30-year-old, who works at the Blue Cross animal charity store in Station Road, Solihull town centre, first thought the alarming discovery was just his colleagues playing a practical joke on him. But when the creature, which was wrapped around the toilet cistern, began to move and slither he quickly realised it was no joke and called out to assistant manager Amy Wallis for help. “I heard this shrieking coming from the toilet,” Amy told the Observer. Luckily for the pair, a customer in the store was on hand to help. The unnamed Solihull College student, who studies animal management and veterinary nursing, quickly identified the serpent as a non-venomous corn snake. The group then set about trying to capture the snake using a plastic coat hanger and picnic basket. Peter said: “The snake was calm and wasn’t aggressive in any way – it just sat there. “So we tried to catch it and put it safely in a picnic basket. 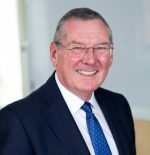 It is not known how the snake got into the Blue Cross charity shop – whether it is a discarded pet, an escapee which slithered up the toilet, or whether it is a beloved household pet that stowed away in a bag of donations. And since it slithered down the U-bend, the serpent has not been seen since. The volunteers called the RSPCA and Severn Trent Water in a bid to catch the snake, but as it had already disappeared not much could be done. 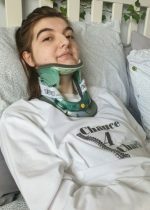 “We have kept the toilet door firmly shut ever since and keep checking to see if it has poked his head up again, but we haven’t seen it,” Amy said. “I like snakes, but I was still terrified when stood face-to-face with one. 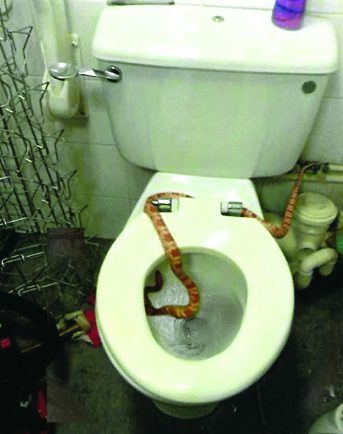 * Have you lost your pet corn snake or has the missing creature popped up in your toilet? E-mail editor@solihullobserver.co.uk if you have any information on the escapee or its whereabouts.